Maximize the value of your new flooring investment when you choose from our broad array of options, including wood look tile in Charlotte, NC. The selection of porcelain and ceramic tile at The Flooring Pros, Inc. includes products from the leading manufacturers you know and love. The houses of today require smart solutions that give the owner the look they want and the durability they need. Many of the designers and decorators we work with love the warmth and charm that comes with traditional hardwood floors. Due to the natural expansion and contraction that comes with the exposure to water and moisture, expansion joints must be included when you decorate with wood. Many choose a textured tile that is designed to look as realistic as natural wood when faced with modern design challenges. Decorate with tile made from porcelain and ceramic to create an interior that is unlike anything you have ever seen. Our selection includes tile with a top photo wear layer that looks as natural as wood. Each is crafted using a process that starts with the firing of specialized clays at specific temperatures. The finished tiles are printed with a photo layer that mimics the texture and grain of various wood species. Tile has been a mainstay of interior decorating for centuries. Any design plan for your kitchen and bathrooms likely includes tile. Our wood plank porcelain tile gives you an expanded set of opportunities for places that have higher levels of moisture. Any tile product must be properly installed with the right grout, or you could face water damage to your subfloor. Choose our group that arrives promptly and gets the job done right the first time. Decorate the walls of any room with tile that matches the comfort and character of wood. Protect the interior of your home from the added moisture you can expect in a bathroom. 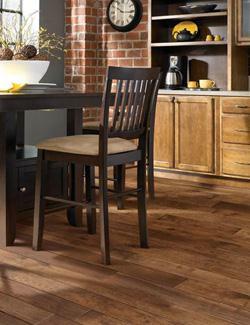 In the hands of a creative installation specialist, our wood plank ceramic tile can make any room come alive. Tile is also easier to heat and cool, so you can remain comfortable during any season of the year. When you invest in ceramic wood tile, you get an innovative product that improves the value of your home. When you combine our porcelain tile with installation by skilled professionals, your floor is sure to endure for years to come. Contact us today to take advantage of our extensive selection of wood look tile. We proudly serve customers in Charlotte, Matthews, Pineville, Sun City, Waxhaw, North Carolina, and the surrounding communities.